Beer #5 of the Portland BeerPlow. It's not summer. It's actually closer to something from the incredible documentary The Day After Tomorrow. 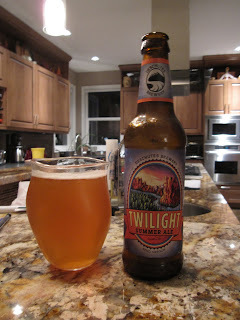 But it was in the fridge, and I love me some Deschutes, so bottoms up. Most summer ales I've had are sort of in the Sam Adams style- light and fruity with some light hoppiness, not really challenging, but then they're not really supposed to be. Not this one. This has all the complexity of flavor one would expect from an outstanding IPA, just without the alcohol punch that could make you regret drinking a sixer on your own. It's just the kind of IPA-style session ale you'd expect to find in San Diego. There's a noteworthy green apple thing going on, with a super clean finish. Damn good all around. If I can find this locally when it's actually summer, I'll be all over it.